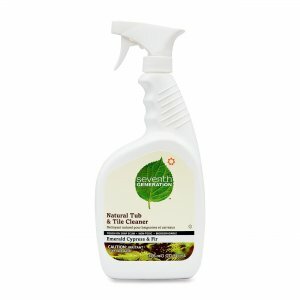 Natural Tub and Tile Cleaner contains a nontoxic formula that safely and effectively removes tough soap scum without creating harsh fumes. Cleaner is made with plant-derived cleaning agents and works hard to keep bathroom surfaces free from soap scum buildup. Fresh scent of Emerald Cypress and Fir is derived from whole essential oils and botanical extracts. Cleaner is USDA Certified Bio-based 97 percent and Kosher and Leaping Bunny Certified. Bottle is made from a high percentage of post-consumer recycled plastic (excluding colorant).